Come Play in the Streets at the 3rd Annual Love Our Lake Day, Sunday, September 20 from 11am to 4pm! 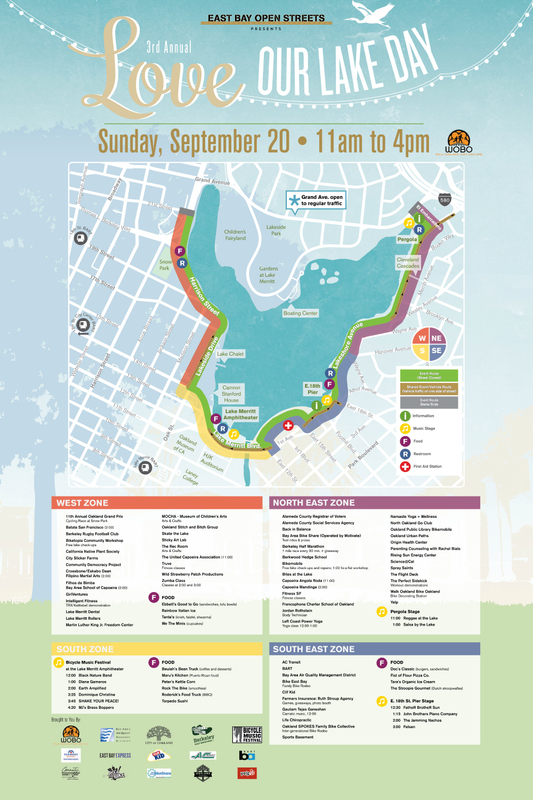 Come play in the streets surrounding beautiful Lake Merritt at Walk Oakland Bike Oakland’s 3nd Annual Love Our Lake Day Sunday, September 20, 11a-4p. The free event offers two car-free miles of human powered fun! Walk, bike, skate, dance, stroll, play and experience Lake Merritt – the nation’s first wildlife refuge – in a new way. The route wraps around the southern flank of Lake Merritt from Lakeshore Avenue, around Lake Merritt Blvd and on to Snow Park. For just a few hours on a Sunday, enjoy dance, arts, health, fitness and community through more than 60 interactive activities hosted by area artists, performers, businesses and community organizations. For the first time this year, Love Our Lake Day will be featuring the Bicycle Music Festival (relocated from SF), the 11th annual Oakland Grand Prix (cycling race) and great eats from local food vendors. Now’s a great time to help out. Be part of an exclusive group of supporters by sponsoring Love Our Lake Day and Sunday Streets Berkeley (Sponsor Packet). Lend a hand or two, and bring a friend to join 100+ volunteers or host an interactive and fun activity and BE part of the joyful day. Lines 14, 18, 26, and 40 will be detoured 9:00 a.m. to 5:00 p.m. Sunday, September 20, 2015. Line 14 to downtown Oakland will serve regular stops on East 18th Street at 6th Avenue and on 12th Street at Fallon Street, but not stops between those points. Line 14 to Fruitvale BART will not be detoured. Line 18 to Albany will serve regular stops on Park Boulevard at Newton Avenue and on 12th Street at Fallon Street, but not stops between those points. Line 18 will not be able to serve the regular stop on 4th Avenue at East 18th Street. Line 18 to Montclair will not be detoured. Line 26 to Lakeshore will serve regular stops on 14th Street at Harrison Street and on Lakeshore Avenue at Lake Park Avenue, but not stops between those points. Line 26 to Emeryville will serve regular stops on Lakeshore Avenue at Lake Park Avenue and on 14th Street at Franklin Street, but not stops between those points. Line 40 to downtown Oakland will serve regular stops on Foothill Boulevard at 6th Avenue and on 12th Street at Fallon Street, but not stops between those points. Line 40 will not be able to serve the regular stop on Foothill Boulevard at 5th Avenue. Line 40 to Eastmont Transit Center will not be detoured. Lines 14, 18, and 40 will serve Line 62 to West Oakland BART stops on 5th Avenue at East 15th Street; at International Boulevard; and at 12th Street.